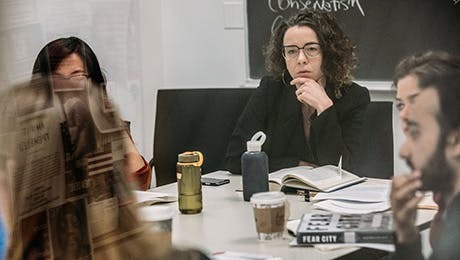 The MA in Anthropology is a 30 credit program combining the theoretical and methodological foundations of social and cultural anthropology with an emphasis on the critical exploration of how ethnographic sensibilities matter in the world today. The program is designed to provide students with a broad understanding of the development of anthropology within the social sciences and introduce them to key concepts and issues that shape contemporary fields of knowledge production. The MA prepares graduates for academic and professional careers in diverse fields, including non-profit organizations, global NGOs, government, museums and cultural institutions, journalism, or further study and research at the doctoral level. Entering students work with an individual faculty advisor. This advisor, together with the departmental student advisor, introduces them to the curriculum as a whole and helps them to balance their focus between substantive knowledge and research and writing practices. A full account of degree requirements and procedures is contained in the Anthropology departmental handbook. To earn the MA in Anthropology, a student must complete a total of 30 credits, of which 18 credits must be listed or cross-listed in Anthropology. These 18 credits include core courses as well as courses within “Perspectives” and “Practices” categories. “Perspectives” courses provide different points of view on the objects of anthropological research, while “Practices” courses emphasize how to approach these objects - from ethnographic fieldwork and other research methods to forms of writing or the discussion of ethical questions as they arise in the course of anthropological inquiries. A maximum of three credits taken at another university may be granted toward the credit requirement for the master's degree. Twenty-seven credits must be completed at The New School for Social Research. After completion of a minimum of 27 credits, students may petition to sit for the MA written examination, which consists of questions based primarily on the required course sequence. The exam is offered once each year, in the Spring. See the academic calendar for examination dates. Students in the Anthropology MA program can apply to enter the PhD program upon successful completion of the MA written examination and submission to the department of a brief written proposal indicating an area of future research. Entry into the PhD program is contingent on faculty evaluation of the applicant's MA exam and overall performance in the master's program, as well as an assessment of the fit of the proposed project within the department and of the applicant's preparedness for doctoral-level work in anthropology.